We've heard it said that, "One good deed deserves another." This month, we've found that old adage to be incredibly true. It all started when we decided to donate the parts and labor to install a free aquaponic fish farm at a high school. 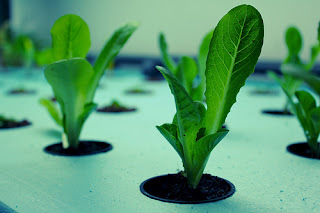 The school had a desire to have an aquaponics system onsite, and the knowledge to use it in their curriculum and facilities, but not the funds to purchase it. We went in, at no cost to the school, and created a fully functioning fish farm that feeds the growth of new plants - a value of about $4500! The finished tank was a huge success! The school will be able to incorporate hands-on training and have access to freshly grown produce for its students. The added benefit was that we felt great knowing we had done a 'good deed' this holiday season! But then, to our surprise, our donated installation enabled the school to apply for and receive two $5000 scholarships for any graduating senior who plans to pursue agricultural studies! Two students will be able to participate in higher education that may not have had the ability to before now. This one good deed is having an avalanche effect that is amazing to us all! As we enter into 2012, let's keep our hearts geared towards what good we can do to others.